We show that the proliferation of Y. pseudotuberculosis is compromised when the bacterium is growing in association with eukaryotic cells compared to free-living bacteria. One factor likely limiting Yersinia proliferation is the metabolically taxing expression of yopE which we show using flow cytometry increases in individual bacteria following their contact with cultured macrophage-like cells. An additional factor limiting Y. pseudotuberculosis proliferation are host cell defense systems which can be significantly ameliorated by disrupting the host cell cytoskeletal system by either exogenously added toxins or by the bacterial-mediated injection of YopE or YopH. Our results demonstrate that despite their metabolic costs the Yop virulence proteins play an important role in enabling Y. pseudotuberculosis to survive and proliferate when confronted with the antimicrobial activities of the eukaryotic cell. Bacterial pathogenesis is often accompanied by, and in some cases a direct result of, proliferation of the microbe within the host. The within-host proliferation of a particular bacterium is determined by its growth and mortality rates; bacterial pathogens can decrease their within-host mortality by attenuating host defense responses. Resisting host defense responses in many cases involves a metabolic cost since it requires the bacterium to express one or more virulence factors. It is likely though that the reduction in a bacterium's within-host growth rate due to the metabolically costly expression of virulence factors is compensated for by the role these factors play in reducing the bacterium's mortality. Although the molecular and cellular mechanisms of a vast number of bacterial virulence factors have been described, quantifying the specific contributions these virulence factors play in promoting bacterial proliferation has been largely ignored. Several species of animal- and plant-interacting Gram-negative bacteria possess an injection system, referred to as type III, that delivers proteins (or effectors) directly into the eukaryotic cell cytosol [1–3]. Type III effector proteins have been demonstrated to play important roles in a variety of host-microbe relationships including Rhizobium-mediated root nodulation, plant hypersensitivity responses, and animal immune responses [4–6]. In the case of the pathogenic yersiniae (Yersinia pestis, Y. pseudotuberculosis, and Y. enterocolitica), the type III effector proteins, referred to as Yops, are required for full virulence in the mouse . In cell culture infection systems, the YopE and YopH type III effector proteins disrupt the host cell cytoskeleton allowing the bacterium to resist phagocytosis [8–14]. The antiphagocytosis activity of YopE and YopH is likely largely responsible for the observation that following their breaching of the outer epithelial cell layer and gaining access to tissue, the yersiniae proliferate primarily extracellularly [15, 16]. Although the eukaryotic-like biochemical activities of the GTPase-activating protein YopE and the tyrosine phosphatase YopH are necessary for their antiphagocytic properties in cell culture infection systems [17–20], it has not been previously demonstrated whether these activities enhance the bacterium's survival following its contact with eukaryotic cells. Another Yersinia type III effector protein, YopJ (YopP in Y. enterocolitica), interferes with stress-activated signaling pathways that lead to increased chemokine gene expression but has no detectable effect on bacterial internalization [21–26]. YopJ activity is likely responsible for the observation that in animals Yersinia is able to colonize tissue without eliciting immune effector cells to the site of infection [15, 27, 28]. YopJ also triggers macrophage-like cells to undergo an apoptotic-like cell death the significance of which, in terms of pathogenesis, is currently unclear since YopJ's signal-blocking and apoptosis-triggering activities have not been (and perhaps cannot be) genetically separated [29–33]. Here we employed growth and viability assays which allowed us to compare the proliferation of free-living and eukaryotic cell-associated Y. pseudotuberculosis and to evaluate the role the type III secretion system and related effector proteins play in the survival of the bacterium during its interaction with eukaryotic cells. In the following experiments stationary-phase Y. pseudotuberculosis were diluted into tissue culture media and added to wells containing eukaryotic cells (or alternatively devoid of eukaryotic cells). After allowing the bacteria to attach to the eukaryotic cells (20–30 minutes), the media overlaying the cells was replaced with fresh media thereby removing unattached bacteria. At various times afterwards the media overlaying the cells was removed and the cells (but not the bacteria) were lysed and the number of viable bacteria present in the resulting lysate was determined by plating. Those bacteria recovered from cell lysates are referred to as 'cell-associated' (which include both extracellular as well as internalized bacteria) to distinguish them from the bacteria present in the overlaying media. Initially we compared the proliferation of wild-type Y. pseudotuberculosis either in the absence or presence of mouse RAW 264.7 macrophage-like cells. The number of Y. pseudotuberculosis increased 8.6- and 293-fold 4 and 8 hours, respectively, following the addition of bacteria to wells containing only tissue culture media (Table I, Experiment #1). The number of cell-associated Y. pseudotuberculosis recovered from wells containing RAW cells increased 4.9- and 75-fold during the 4 and 8 hour incubation times (Table I). One possible explanation for the differences in proliferation rate between free-living and cell-associated bacteria is that in the latter bacteria may become detached from the cell monolayer during the incubation time and thus would be removed with the overlaying media at the time of harvest. Therefore we assayed the total number of viable bacteria in both the cell-associated and the media fractions in an experiment identical to that described in Table I and obtained a similar result: the proliferation of bacteria added to tissue culture wells containing eukaryotic cells was substantially less than that of bacteria added to tissue culture wells devoid of eukaryotic cells (not shown). Y. pseudotuberculosis was added to wells containing either tissue culture media alone or cultured RAW cells (MOI = 0.2). Shown is either the titer of the wells containing tissue culture media alone (media) or the number of bacteria recovered from wells containing RAW cells (cell-associated). Three independent wells for each condition were assayed and the fold-increases are indicated (± sample standard deviation). b. Similar infection as in Experiment #1 except that some cells were treated with 10 μg/ml cytochalasin D 30 minutes prior to the addition of the bacteria. To test whether the observed decreased proliferation of cell-associated Y. pseudotuberculosis compared to bacteria incubated in tissue culture media alone could be due, at least in part, to the anti-microbial activity of the RAW macrophage-like cells, we pretreated RAW cells with cytochalasin D, a fungal toxin that inhibits bacterial internalization and killing by disrupting the cytoskeletal network . The number of Y. pseudotuberculosis recovered from wells containing untreated cells increased 39-fold after a 6 hours infection period whereas the number of Y. pseudotuberculosis recovered from wells containing cells treated with cytochalasin D increased 70-fold (Table I, Experiment #2). Cytochalasin D does not affect the proliferation of Y. pseudotuberculosis in tissue culture media alone (not shown). Together these results show that macrophage-like cells retard the proliferation of Y. pseudotuberculosis and that this activity is at least partially dependent on an intact cytoskeletal system of the host cell. Y. pseudotuberculosis's type III secretion system directly injects a number of virulence proteins directly from the bacterium into the eukaryotic cell cytosol. Previously it has been shown at the single-cell level that the activity of the promoter controling the expression of one of these virulence proteins, YopE, increases following contact of Y. pseudotuberculosis with HeLa cells [14, 35]. To test whether Yop expression increases following contact with macrophage-like cells in our infection assay, we measured the activity of the yopE promoter using a Y. pseudotuberculosis strain, yopE::gfp, that contains a gfp gene inserted between yopE's stop codon and its transcriptional termination sequence. First we analyzed by flow cytometry the pattern of GFP expression by the yopE::gfp strain at either the optimal growth temperature of 26°C or in conditions that induce Yop expression (37°C). yopE::gfp bacteria exhibited very little green fluorescence when incubated at 26°C (Fig. 1a). 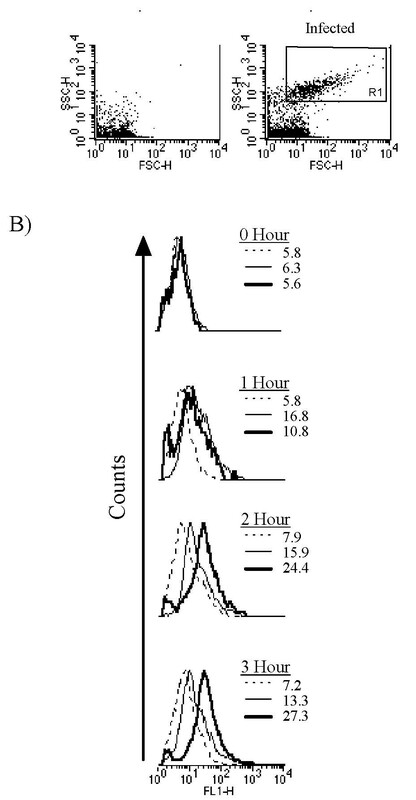 In contrast, following incubation of yopE::gfp bacteria at 37°C the green fluorescence of individual bacteria increased within the initial 15 minutes and continued to rise throughout the 3-hour experiment (Fig. 1). The wild-type Y. pseudotuberculosis strain possessed very little green fluorescence (i.e. autofluorescence) (not shown). GFP expression in the yopE::gfp strain. Stationary-phase yopE::gfp were diluted into media optimized for inductive Yop expression (see Materials and methods) either at 26°C or 37°C. At the indicated times samples of bacteria were removed from each culture and analyzed by flow cytometry. Shown is the FL1 signal (green channel) of 104 size-gated bacteria (not shown; see Fig. 4a) from the 26°C (thin line) and the 37°C (thick line) cultures. The mean fluorescence intensity of the size-gated bacteria from each culture is shown. 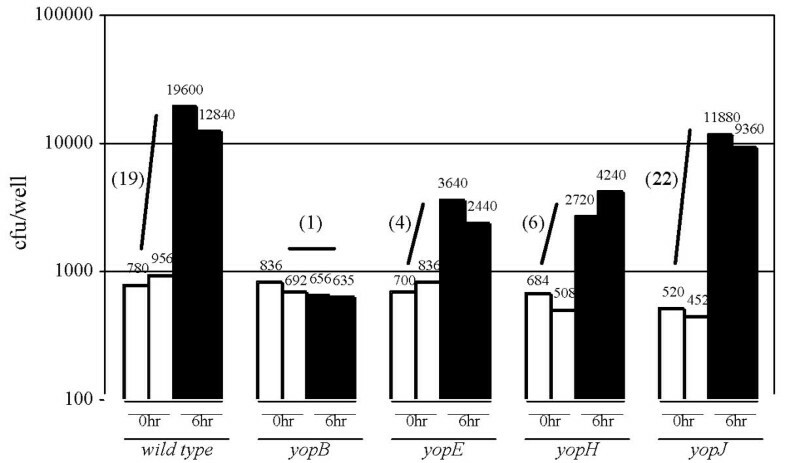 To check whether the alteration in the yopE gene of the yopE::gfp strain affected YopE expression, we analyzed YopE protein levels in samples of either growing (26°C) or induced (37°C) cultures of the wild-type and yopE::gfp strains. Barely detectable YopE levels were observed in growing cultures of either strain at 26°C whereas in cultures incubated at 37°C increased YopE protein levels were observed in both strains within 15 minutes of the start of induction and continued to increase throughout the 3-hour experiment (not shown). Although slightly lower YopE protein levels were observed in the yopE::gfp strain compared to the wild-type strain, this reduction of YopE levels in the yopE::gfp strain did not have an apparent effect on the performance of this strain in the viability-based cell culture infection assay (described above) where it behaved similarly to the wild-type strain (not shown). These data show that inductive Yop expression can be monitored at the single cell level in the yopE::gfp strain by assaying for GFP expression and that the interaction of this strain with eukaryotic cells resembles that of the wild-type strain. We then utilized the yopE::gfp strain to measure yopE promoter activity in bacteria either in tissue culture media alone or in physical contact with eukaryotic cells. After 1 hour following the dilution of yopE::gfp bacteria into tissue culture media, a modest increase in GFP expression was observed in bacteria incubated at 37°C compared to bacteria incubated at 26°C; the differences in the mean fluorescence intensity between these two cultures remained relatively constant during the rest of the experiment (Fig. 2). 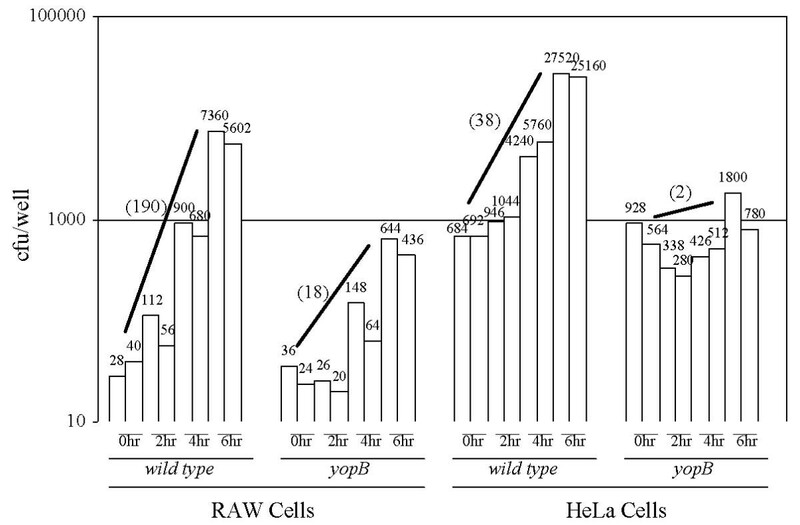 A further increase in GFP expression was observed in cell-associated bacteria compared to bacteria incubated at 37°C in tissue culture media alone (Fig. 2). These data are in agreement with a previous study  which showed that the yopE promoter is 'superactivated' upon Y. pseudotuberculosis' s contact with eukaryotic cells. The metabolic costs of this contact-enhanced Yop expression could be an additionally factor, together with the host cell defense systems, that reduces the proliferation rate of cell-associated Y. pseudotuberculosis compared to free-living bacteria shown in Table I.
GFP levels in the yopE::gfp strain either in the absence or presence of eukaryotic cells. 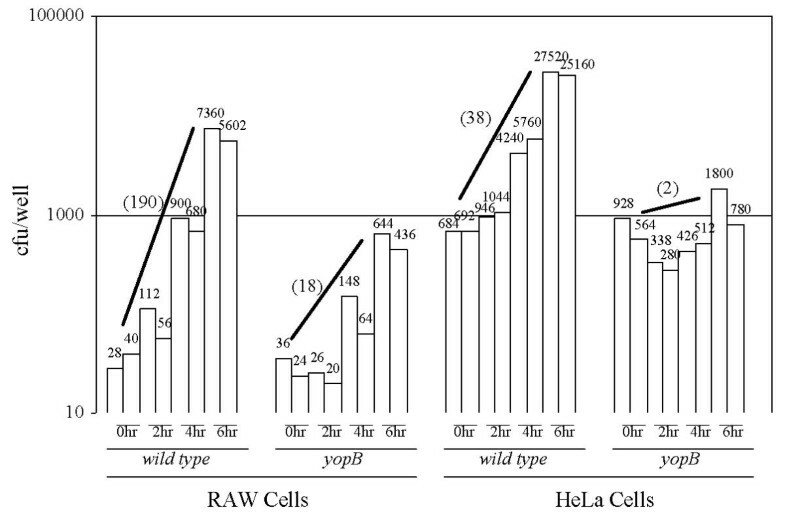 (A) Forward (x-axis) and side (y-axis) light scattering plots of lysates made from either uninfected (left) or yopE::gfp-infected (right) RAW cells. (B) FL1 signals (green channel) of Rl-gated events (shown in [A]) either in yopE::gfp cultures diluted into tissue culture media (26°C-dotted line; 37°C-thin solid line) or of lysates made from RAW cells infected with yopE::gfp at a multiplicity of infection (MOI) of 20 (thick solid line). The mean fluorescence intensity of the size-gated bacteria from each culture is shown. To test whether Y. pseudotuberculosis's. type III secretion system affects the proliferation of the bacteria in the cell culture infection assay described above, we infected RAW cells with either the wild-type or the yopB strains of Y. pseudotuberculosis. Although the yopB mutant strain expresses and exports the Yops from the bacterial cell in a manner that is indistinguishable from the wild type, it is unable to inject Yop effectors into the host cell cytosol . Following a 6-hour infection period, the number of cell-associated wild-type Y. pseudotuberculosis increased several-fold whereas the fold-increase of the yopB strain was considerably less (Fig. 3). A similar pattern of proliferation of these two strains were observed using HeLa cells (Fig. 3). 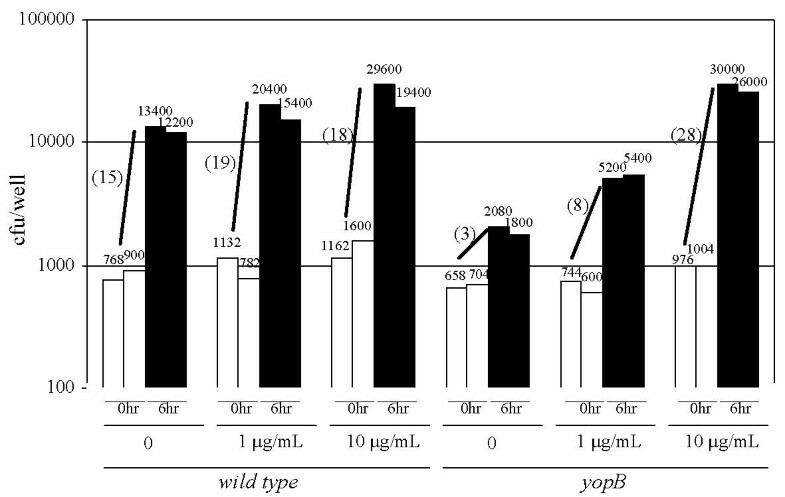 There was no detectable differences between the growth rates of the wild-type and yopB strains (nor the yopE, yopH, or yopJ strains used below) in tissue culture media alone (not shown). Infection of cultured eukaryotic cells with the wild-type and yopB strains of Y. pseudotuberculosis. RAW macrophage-like cells (left) or HeLa cells (right) were infected with the indicated strain at a MOI of either 0.04 (left) or 0.4 (right). At the indicated times after the removal of unattached bacteria, the number of cell-associated bacteria per well was determined by viable plating. Shown both graphically and numerically are the number of colony-forming units (cfu) of two independent wells per time point. In parenthesis is the average fold-increase of each strain after the 6-hour infection period. Although the fold-increases of the wild-type and yopB strains could vary between different experiments (e.g. see Fig. 5 and 6), within an experiment the fold-increase of the wild-type strain was consistently 5- to 30-fold higher than the fold-increase of the yopB strain after a 6-hour infection period. These results clearly show that a functional type III secretion system enhances the proliferation of eukaryotic cell-associated Y. pseudotuberculosis. Viability assessment of Y. pseudotuberculosis by vital staining. (A) Various combinations of live and isopropanol-killed Y. pseudotuberculosis were mixed, stained with SYTO 9 and propidium iodide, and analyzed by flow cytometry. Shown in the left column are the light-scattering plots of cultures containing either 100% live bacteria (top), 100% killed bacteria (bottom), or an equal mixture of live and dead bacteria (middle). The histograms shown to the right of each light-scattering plot are the corresponding signals in the FL1 (green channel) of the R1-gated events. The Medium fluorescence intensity of the events within the Ml region were 184 (top) 99 (middle) and 30 (bottom). (B) RAW cells were infected with either the wild-type (top) or yopB (bottom) strains at a MOI of 20 for 2 hours following which the bacteria were recovered, stained with SYTO 9/propidium iodide, and analyzed and presented as in (A). The percentages of the events falling in either the lower left (11) or upper right (ur) quadrants in the light-scattering plots were 36% (11) and 42% (ur) for the wild type and 43% (11) and 37% (ur) for yopB. In parenthesis is shown the medium fluorescence intensity of the events within the M1 region. Infection of RAW cells with various Y. pseudotuberculosis Yop mutant strains. Cells were infected as in Fig. 3 with the indicated strains at a MOI of 1 and the number of cell-associated bacteria of two independent wells were determined either immediately after the removal of unattached bacteria (unfilled bars) or 6 hours later (filled bars). In parenthesis is the average fold-increase of each strain after the 6-hour infection period. Infection of cytochalasin D-treated RAW cells. Cells were treated with the indicated concentrations of cytochalasin D 30 min prior to the addition of either the wild-type or yopB strains of Y. pseudotuberculosis at a MOI of 0.2. The number of cell-associated bacteria of two independent wells were determined either immediately after the removal of unattached bacteria (filled bars) or 6 hours later (unfilled bars) and the average fold-increase of each strain during the 6-hour infection period is shown in parenthesis. In the experiments shown (as well as those described below) eukaryotic cells were infected at a relatively low multiplicity of infection (MOI) eliminating the possibility of co-operative behavior between bacteria. We tested various MOIs over a 125-fold range and found that, although as expected the absolute number of bacteria recovered from infected cells increased with increasing MOIs, the fold-increases of the bacteria after a 6-hour infection period remained relatively independent of the MOI (not shown). The greater proliferation of cell-associated wild-type Y. pseudotuberculosis compared to the yopB strain in the experiments shown in Fig. 3 could be due to a higher mortality rate of the yopB strain during its interaction with eukaryotic cells. To measure viability status directly we examined the dye permeability properties of wild-type and yopB bacteria during the cell infection assay. Using the green-staining SYTO 9 and red-staining propidium iodide (PI) dyes, which label either all bacteria (SYTO 9) or only those with damaged membranes (PI) , we observed decrease green fluorescence in isopropanol-killed bacteria compared to viable bacteria (Fig. 4a). In bacteria with compromised membranes the SYTO 9 fluorescence is quenched by PI. Additionally, we observed decrease light scattering in isopropanol-killed cultures compared to cultures containing viable bacteria (Fig. 4a). SYTO 9/PI-stained wild-type bacteria recovered from infected RAW cells exhibited higher green fluorescence as well as light scattering properties compared to similarly treated yopB bacteria (Fig. 4b). These results support a scenario in which the reduced proliferation of the yopB strain (compared to the wild type) in the viability-based plating experiments is a consequence of it being unable to resist the antimicrobial killing activity of the host cell. We infected RAW cells with a panel of Y. pseudotuberculosis strains mutated in the various yop genes in order to test whether individual Yops affected bacterial proliferation in the cell culture infection assay. The yopE and yopH strains increased by 4- and 6-fold, respectively, after a 6-hour infection period compared to the 19- and 1-fold increases of the wild-type and yopB strains, respectively (Fig. 5). In contrast to the yopE and yopH strains, the increase of the yopJ strain was similar to the increase observed for the wild-type strain. Since YopE and YopH have previously been shown to disrupt the host cell cytoskeletal system and consequently to block phagocytosis (see Background), the contribution of these proteins in enhancing Y. pseudotuberculosis proliferation in the cell culture infection assay could be due to their antiphagocytic activity. The activities of YopJ on the otherhand, which include blocking various stress-activating signaling pathways and inducing apoptosis, likely influences the course of Y. pseudotuberculosis infection at the whole systems level such as interfering with induced inflammatory-like responses . 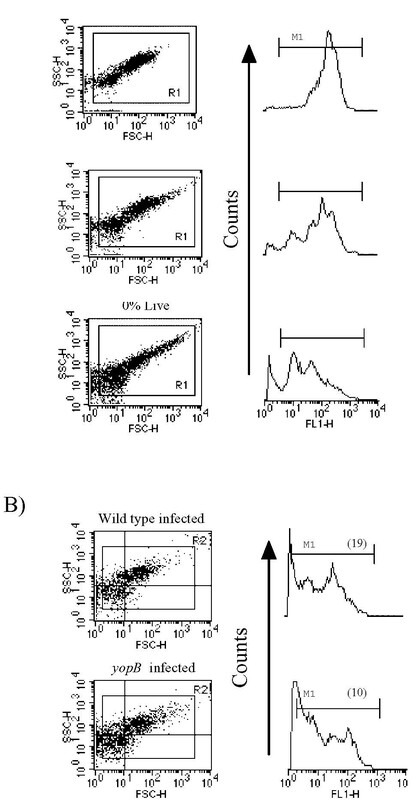 If, as these results suggest, phagocytosis is detrimental to the proliferation of Y. pseudotuberculosis following its contact with eukaryotic cells, we would expect that cytochalasin D should at least partially rescue the Y. pseudotuberculosis strains that lack an intact type III secretion system. Similar to the data shown in Table I, cytochalasin D treatment resulted in a modest increase in the number of wild-type Y. pseudotuberculosis recovered after a 6-hour infection period (Fig. 6). Strikingly, cytochalasin D treatment had a considerable effect on the proliferation of the yopB strain after a 6-hour infection period (Fig. 6). In fact in the experiment shown, using cells treated with 10 μg/ml cytochalasin D, the 6-hour fold-increase of the yopB strain exceeded that of the wild-type strain. These data show that cytochalasin D can functionally complement for the type III secretion system and supports the hypothesis that the cytoskeletal-disruption activity of YopE and YopH accounts for their respective activities of enhancing Y. pseudotuberculosis proliferation following its contact with eukaryotic cells. These data also bolster the view that, at least under certain conditions, remaining extracellular is crucial for Yersinia's livelihood. We show that the antimicrobial activity of the eukaryotic cell negatively affects Y. pseudotuberculosis proliferation and that this antimicrobial activity is significantly ameliorated by the YopE and YopH virulence proteins. The YopE and YopH proteins enhance the survival of the bacterium following its contact with eukaryotic cells likely by disrupting the cytoskeletal system thereby interfering with the host cells ability to internalize the bacterium. The increase in Yop expression following host cell contact likely has a negative effect, due to its metabolic costs, on the bacterium's maximal growth rate but is compensated for by the Yop-mediated decrease in bacterial mortality. Bacteria were grown in 7.4% of Brain Heart Infusion (BHI) (Oxoid; Hampshire, UK) supplemented with 20 mM MgCl2 and 5 mM EGTA [ethylene glycol-bis (beta-aminoethyl ether)-N, N, N', N'-tetraacetic acid] (Sigma) to stationary phase by shaking at 26°C. For analysis of GFP and YopE expression (Fig. 1), overnight cultures were diluted 1/20 into fresh BHI/MgCl2/EGTA and shaken either at 26°C or 37°C  and at indicatedtimes samples were removed and prepared for flow cytometry (see below). For infection assays, overnight bacterial cultures grown in BHI/MgCl2/EGTA were diluted 10-6 (unless otherwise noted) with tissue culture media (RPMI 1640/10% fetal calf serum [GibcoBRL]) and 400 μl of this dilution was added to 24-well tissue culture plates containing 2 × 105 eukaryotic cells per well which had been previously washed free of antibiotics. Twenty to thirty minutes after the addition of the bacteria to the wells the overlaying media was removed and replaced with 250 μl antibiotic-free tissue culture media. Cells were harvested by first removing the overlaying media and adding 400 μl lysis buffer (0.1% NP40, 15 mM Nacl, 1 mM Tris pH8) and the resulting lysate was either assayed for the number of viable bacteria (by plating) or analyzed by flow cytometry. 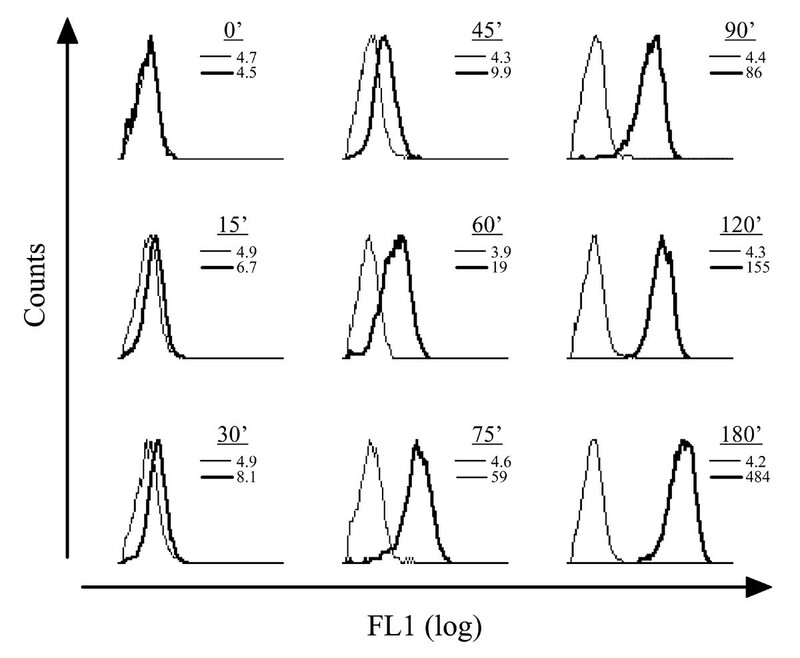 For flow cytometric analysis lysates were centrifuged, the pellets washed once with Phosphate Buffered Saline, pH 7.4 (PBS), resuspended in PBS, and either analyzed directly for GFP expression (Fig. 2) or stained with STYO 9 and propidium iodide (Molecular Probes) for 20 min prior to flow cytometry (Fig. 4). A minimum of 104 events per sample were analyzed using a FACSort flow cytometer (Becton-Dickinson). We thank Tomas Leanderson, Eva Miller, Jean-Marie Dukuzumuremyi, Ulrich von Pawel-Rammingen, Matt Bennett, Lukas Cederbom, Ulf Yrlid, Anders Olsson, and Hans Wolf-Watz for their generosity and helpfulness. Supported by the Swedish Medical Research Council (MFR), the Swedish Foundation of Strategic Research, Active Biotech (Lund, Sweden), and by kind donations from the Crafoordska and the Greta and Johan Kocks Foundations.